DONBASS – a film from Ukrainian director Sergey Loznitsa is coming to Brisbane for two weeks from October 18th! 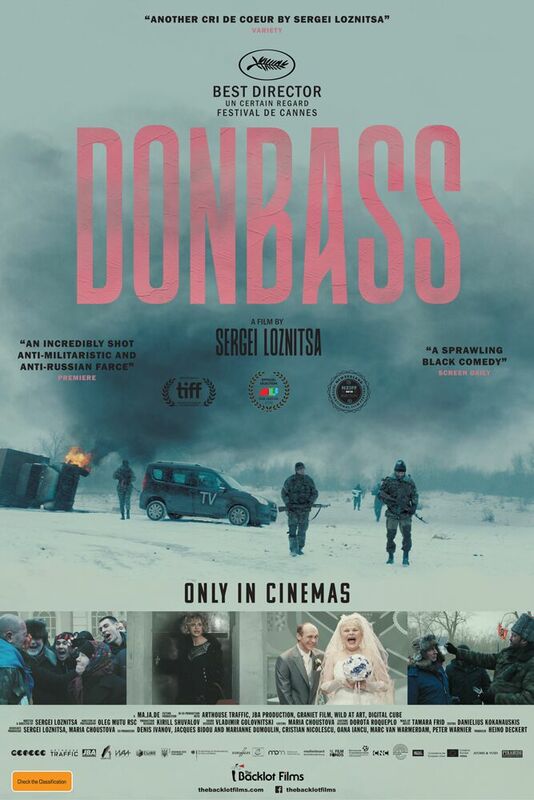 The Ukrainian Community of Queensland has been able secure a discounted ticket rate to the screenings of DONBASS at New Farm Cinemas and The Elizabeth Picture Theatre for our members and friends. The film will screen from Thursday 18th October to Wednesday 31st October at New Farm Cinemas at 4pm daily and at The Elizabeth Picture Theatre at 12pm daily. 1. Click on the link below to the cinema you want to see DONBASS at. 2. Select the “Child $10” option – this will save you $5 per ticket! 3. When you go to the cinema, tell them you’re with the Ukrainian Community of Queensland and mention discount code UKRQLD and they’ll let you in at the discounted rate! Please be aware that the film is spoken primarily in Russian, with some Ukrainian and is subtitled in English. Best Director (Sergei Loznitsa) Un Certain Regard, Cannes Film Festival 2018 | Official Selection at Cannes (Un Certain Regard) 2018 | Official Selection at Karlovy Vary International Film Festival, 2018 | Official Selection at Munich International Film Festival, 2018 | Official Selection at New Zealand International Film Festival, 2018 | Official Selection at Melbourne International Film Festival, 2018 | Official Selection at Toronto International Film Festival, 2018 | Official Submission by Ukraine for Best Foreign Language category at 2019 Oscars. Ukraine has selected Sergei Loznitsa’s Donbass, a drama centered on an ongoing military conflict in East Ukraine, for the best foreign-language film Oscar race. “Tackling a bloody struggle that these days barely registers in the media beyond the region itself, despite the fact that the shady Ukrainian connections to President Donald Trump and his cronies keep bobbing up in the news, the film feels timely and borne of deep-held despair at the senseless strife tearing the country apart,” wrote THR in its review. Named after one of the regions controlled by the separatists, Donbass premiered in the Un Certain Regard section at Cannes this year, winning Loznitsa the section’s directing prize. Donbass is Loznitsa’s fourth feature. All of this previous features, My Joy, In a Fog and A Gentle Creature, screened in the official selection at Cannes. Donbass is Ukraine’s 11th foreign-language Oscar submission since 1997. No Ukrainian film has made the shortlist for the Academy Awards.